One door closes and another door opens. Iran now turns to China. 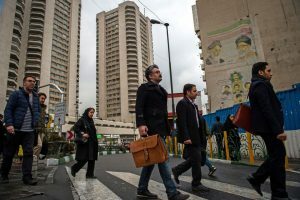 After the Obama administration negotiated the JCPOA (Joint Comprehensive Plan of Action) with Iran in 2015, the expectation was that a flood of western investment would pour into Iran to help revive its stagnant economy. From 2011 to 2013, the U.S. and western allies had a stringent regime of economic sanctions on Iran. These sanctions excluded Iran from the global payments systems that allowed it to receive hard currencies in exchange for oil shipments or pay for imports of technology and consumer goods. The sanctions were strangling the Iranian economy, causing bank runs, hyperinflation, and a currency collapse. Smuggling and black-market currency exchanges were the only ways for Iranian consumers to get the electronics and iPhone — that they like in Iran as much as we do. Once the JCPOA negotiations started in 2014, the sanctions were lifted in stages. When the JCPOA was agreed to in 2015, the sanctions were lifted almost entirely. German and French companies began large scale sales of aircraft and other goods to Iran. The lifting of sanctions also allowed Iran to sell its oil freely on world markets for hard currency. The U.S. also shipped hundreds of billions of dollars of cash and gold to Iran to help jumpstart its economy. Now all of this has come crashing down. Trump has suspended the JCPOA and reimposed the sanctions. European and U.S. banks won’t dare conduct transactions with Iran. Aircraft and other sales have been suspended. The western financial and export doors are now shut to Iran. But, as this article reports, Iran still has one friend in the world, which is China. Iran can still ship oil to China in exchange for yuan or gold and China is ready, willing and able to invest in Iranian infrastructure. All of this means a reduced role for dollars and an increased role for the petro-yuan and gold going forward. The best way for U.S. investors to stay ahead of this change is to buy physical gold and hitch a ride on the new Iran-China gold nexus.